Historical and contemporary, lit with flashes of magic and violence, this intriguing novel offers multifaceted portraits of India and England as seen from the perspective of a clever, burdened misfit. Released now in the U.S. after the success of his second novel, this prizewinning debut by Mukherjee (The Lives of Others, 2014) impresses with its fluid originality and ambition. 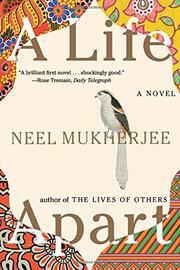 Alternating chapters explore parallel narratives, one involving Miss Maud Gilby, an early-20th-century campaigner for women’s education in colonial Bengal, the other devoted to modern-day Ritwik Ghosh, who escapes from Calcutta via a two-year scholarship to a British university and then stays on beyond his visa to live in social limbo in London. Horribly abused by his mother, Ritwik abandoned India after his parents’ deaths but is now unmoored, with no religion or home, and is further marginalized by his homosexuality. Maud Gilby, meanwhile, turns out to be a minor character from fiction borrowed by Ritwik to feature in the story he's writing about India during a time of anti-British ferment, a tale of dislocated experience and exile mirroring Ritwik’s life. In London he descends into the gritty worlds of undocumented labor and prostitution, scenarios intercut with oddly tender episodes spent taking care of his landlady, an 86-year-old with a past in India whom he tends with a concern that he could never show to his own mother. Ritwik’s addiction to casual hookups draws him back repeatedly to the perilous yet thrilling sexual meat market around King’s Cross Station, where he will find an inverted salvation through his relationship with a shady foreigner but will also discover the price of apartness. Consistently confounding expectations, Mukherjee’s story of the gathering descent of a solitary soul is both poignant and unsentimental, the work of a notably sophisticated writer.